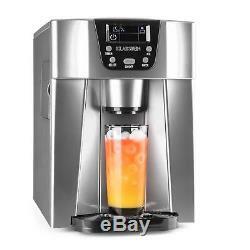 Silver ice cube machine with 2 litre water tank. Easy-to-understand operation with soft-touch control. 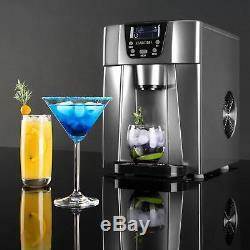 Silver ice cube machine with 2 litre water tank and blue LED lighting. Quiet-running CFC-free high-performance compressor with low operating noise. Absolutely taste-neutral plastic liner and pumping system. Easy-to-understand operating section with soft-touch operation, practical dispenser for direct filling into the glass. Up to 12 kg of ice cubes in 24 hours, 0.6 kg of storage tank. Production time: about 6-12 min. Depending on the size (equivalent to approximately 9 ice cubes). Production volume: about 12 kg daily. 2 selectable ice cube sizes: small and large. Coolant: R134a (56 g) / R600a (25g). Timer function for automatic starting as well as stopping ice cube production. Warning signal when water level is low. Warning signal when ice cube holder is full. Safety fuse (won't run when empty, no production when holder is full). Dimensions: about 25 x 35 x 37 cm (WxHxD). Weight: about 9.3 kg. English user manual (other languages: German, French, Italian,ish). 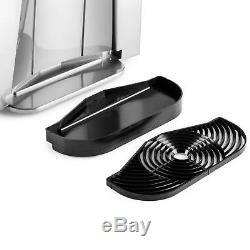 Ice cube maker with 2-litre water tank to prepare ice cubes in 2 different ice cube sizes and bullet shape. Elegant case with taste-neutral inner lining and pump system with 12 kg of ice cube capacity and 0.6 kg of ice supply. Easy operation thanks to soft-touch control and LED display, lightning-fast preparation cycle of 6-10 minutes. An eruption of refreshing cold: with the Klarstein Ice Volcano 2G ice cube maker , bring ice cold drinks to hot parties! 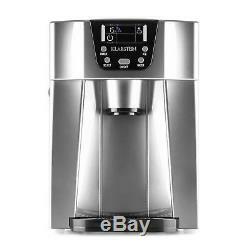 Kitchen and countertop friendly, it is easy to find a place for the Klarstein Ice Volcano 2G ice cube machine , even in cramped conditions, so that it can provide parties and events with refreshing ice cubes. After only 6 to 12 minutes, the first cubes fall into the 0.6 kg large storage container. Up to 12 kg of ice cubes are transported directly via a dispenser into tumblers and cocktail glasses by the Ice Volcano in a 24-hour eruption. In order to get the right size of ice cube, you may select between small and large cubes. If the 2-litre tank is drained of water during ice cube production or if the storage container is full, a warning signal will indicate and the ice cube maker will stop its activity. The operation of the Klarstein Ice Volcano 2G ice cube maker is made easy via a soft touch control with clear LCD display. The start or stop timers may also be programmed here with just a few pushes of a button - thus the ice cube production will start or end when you want. Thanks to state-of-the-art cooling technology, the working noise is pleasantly quiet so that it will not disturb the ambience of your event. Taste-neutral materials in the inner workings guarantee pure refreshment. 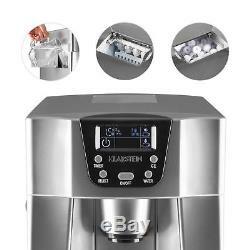 The Klarstein Ice Volcano 2G ice cube maker provides an ice-cold burst of refreshing ice cubes. Available versions: silver , black (10030844), red (10030849). 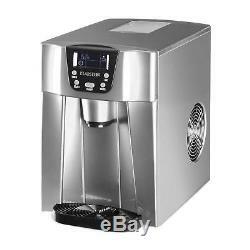 The item "Ice maker Machine 2 Cube Sizes Commercial Dispenser 12 kg/ day 2 L Tank 100W Bar" is in sale since Wednesday, August 9, 2017. This item is in the category "Home, Furniture & DIY\Appliances\Small Kitchen Appliances\Ice Makers". The seller is "hifi-tower" and is located in Germany +. This item can be shipped to United Kingdom.